Get the perfect polisher and the knowledge to master it. 60 Day Money-Back Guarantee. If your Cyclo doesn__t easily produce glossy, swirl free paint, return it for a 100% refund that includes your shipping in both directions. Produce world-class shine without burning paint or leaving swirl marks. Risk free polishing. Unlike a buffer, you can__t burn paint with a Cyclo. Low vibration. Unlike other orbital polishers (Flex, Porter Cable), the Cyclo__s VES (Vibration Elimination System) minimizes vibration that fatigues your joints and muscles. Durability. With 60 years of engineering, the Cyclo design is legendary for not letting its owner down. Scratch removal. Remove clearcoat scratches like a rotary buffer with our combination of pad, compound, and added hand pressure. Paint polishing. Remove swirls and add gloss 25% faster with no loss in results. Waxing. Techniques for spreading wax 25% faster without creating _cleanup__ work in trim and panel gaps. Caring for your pads and Cyclo. Discover simple ways to extend the life of your pads and polisher. 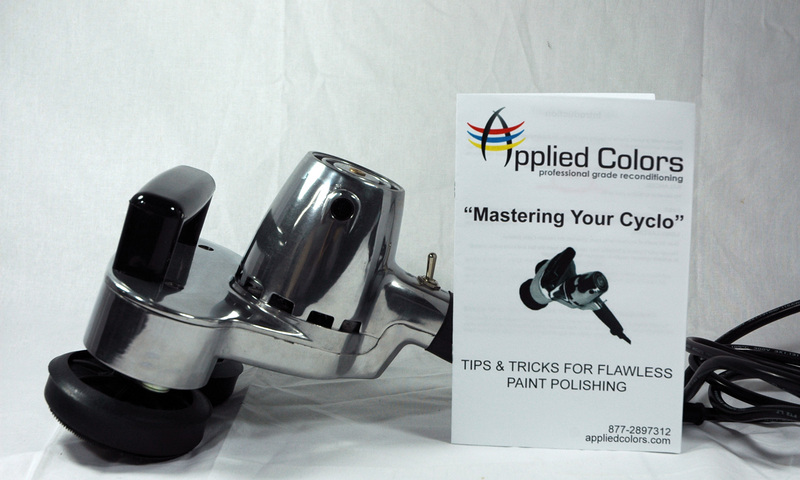 Click the button below to add the Cyclo Model 5 Single Speed Polisher + Tips & Tricks Booklet to your wish list.